I have been wanting to do this for awhile. I have went through tons and tons of Pins to find the perfect recipe. Is there a perfect recipe for this? I don’t know but I found the perfect recipe for me, it was more the measurement and technique I needed. I omitted and added a few things here and there. Yes that little bitty pale unassuming seed that adorns out hamburger buns. You take that seed, work a little bit of magic, and BAM! 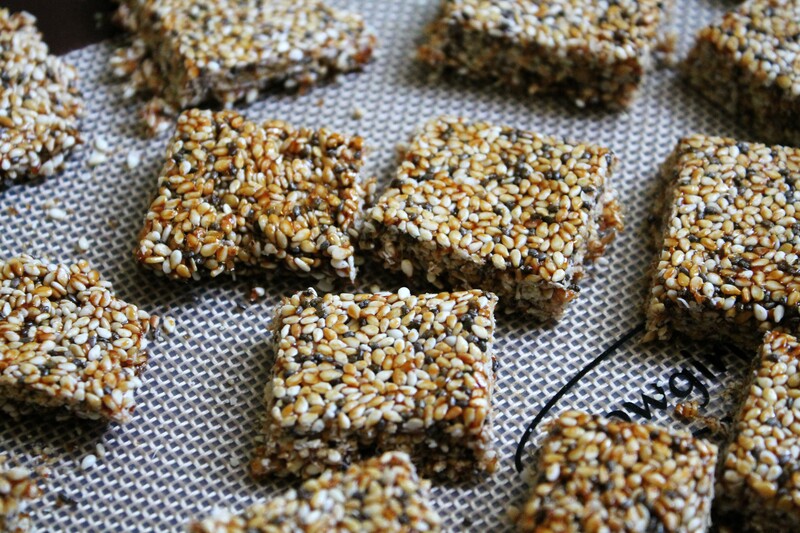 You have a nice little candy that makes a great tasting, sorta close to healthy snack. 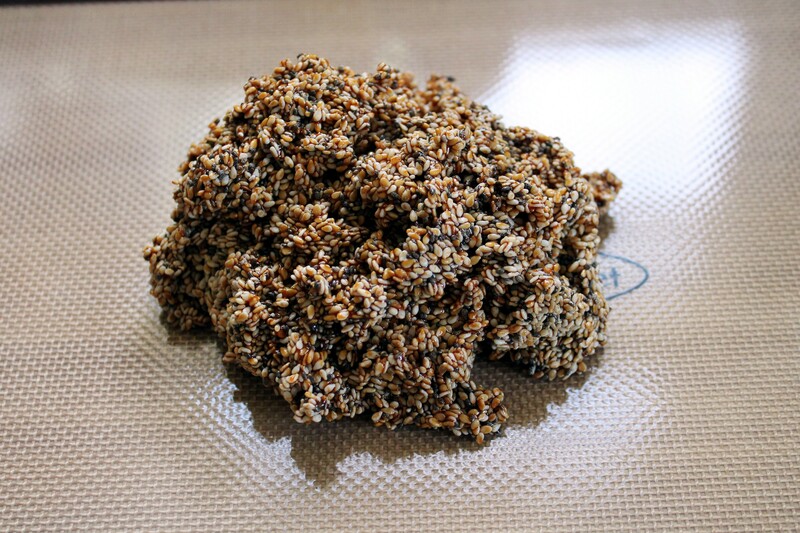 Here is the original Sesame Candy recipe. Below is my adapted recipe along with my account of the whole process. 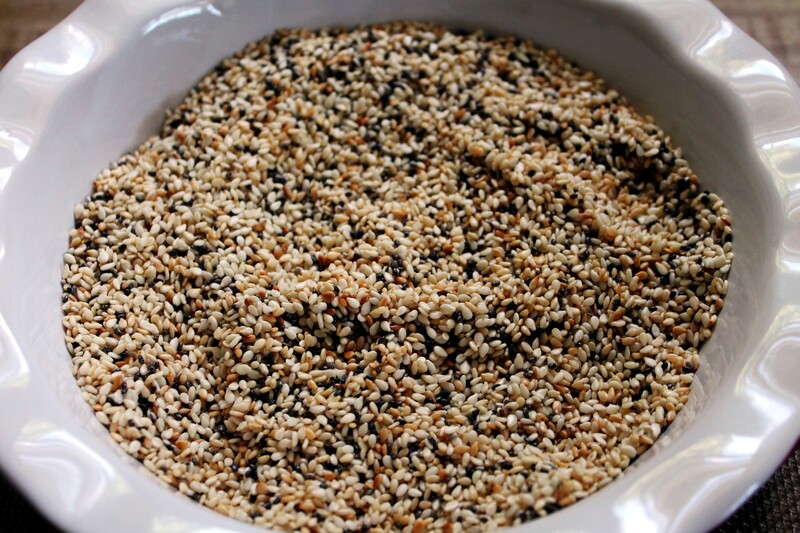 Dry roast your sesame seeds for 5-7 minutes. Pour into a bowl add the Chia seeds and mix well. Set aside. In a small pot add the sugar and honey. Bring to a boil, now simmer for 5 minutes. Stirring constantly. Add seeds. Stir. 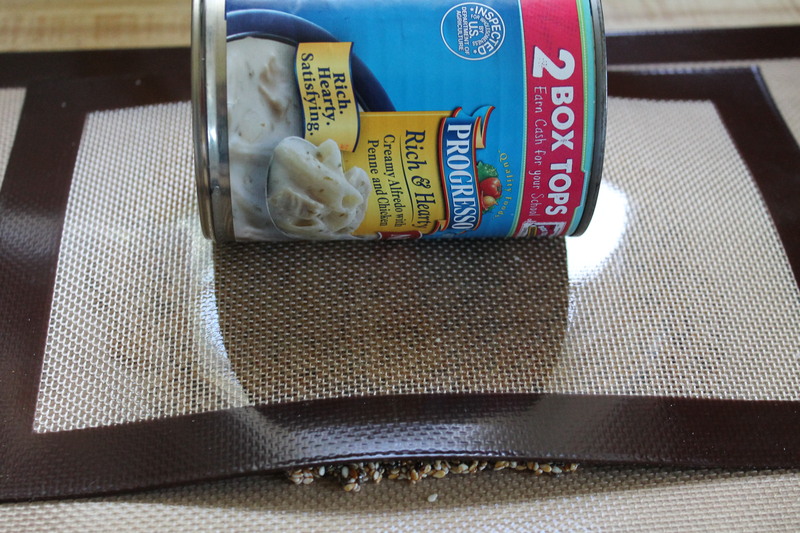 Pour onto a piece of wax paper or a silicone baking mat. Cover with another sheet of wax paper, roll candy with a rolling pin until about ½ inch thick. With a knife cut/score into 1 inch squares. Let cool. Break apart. Done! 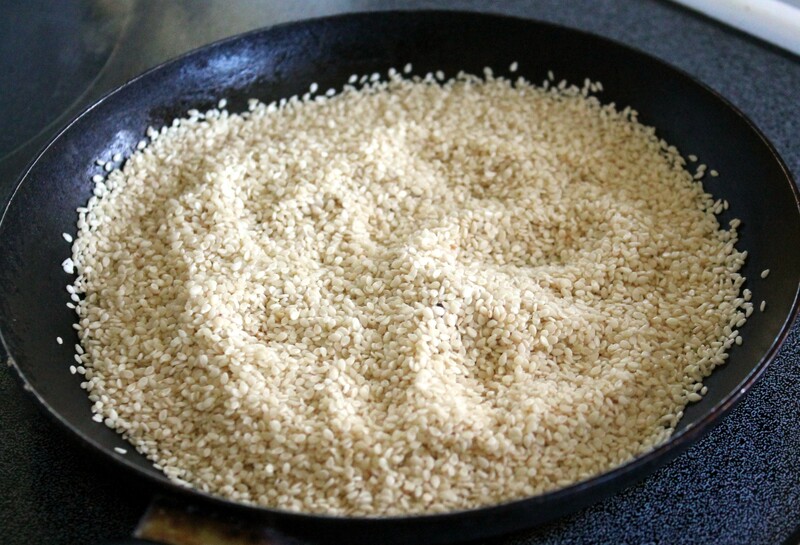 I measured out my sesame seeds, put them in the pan to toast. I toasted mine the full 7 minutes because I wanted some of my seeds a dark brown color. 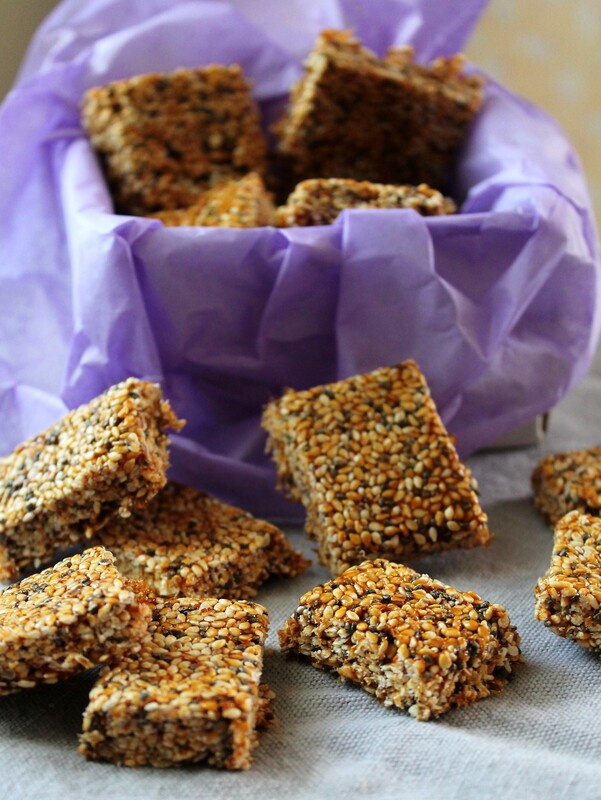 After toasting I pit them and the Chia seeds in a dish. I happened to have my small pie dish close by so I used it. The pot was on the stove to heating up while I mixed my seeds together. So the pot was hot when I started measuring out the honey. I poured my first tablespoon in and it went wild with the boiling. 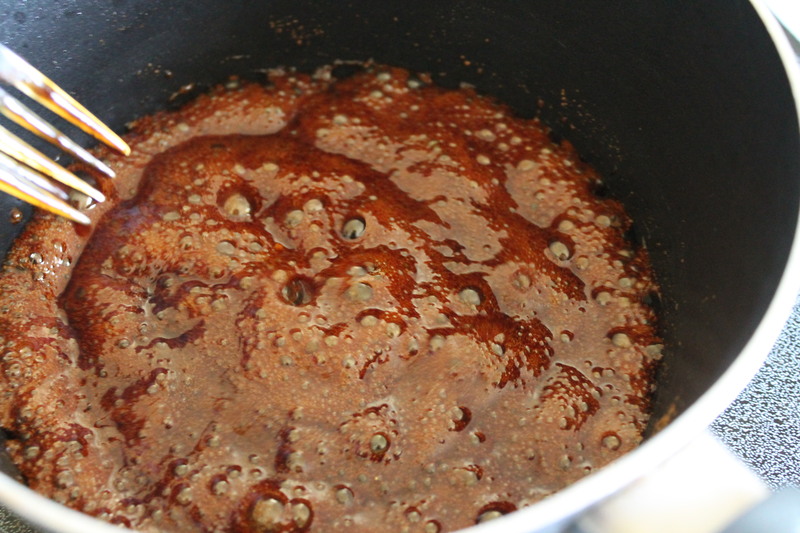 So I had to work fast to get all the honey and the coconut sugar in the pot, while trying to stir at the same time. FYI: have what you need in arms reach, closer if you can. I was like a crazy woman trying to do all that at once with everything I needed in different place around the kitchen. Boiling, boiling, get that stuff a boiling. 5 minutes and a lot of stirring later I poured in my seeds and began mixing, this comes together quick. 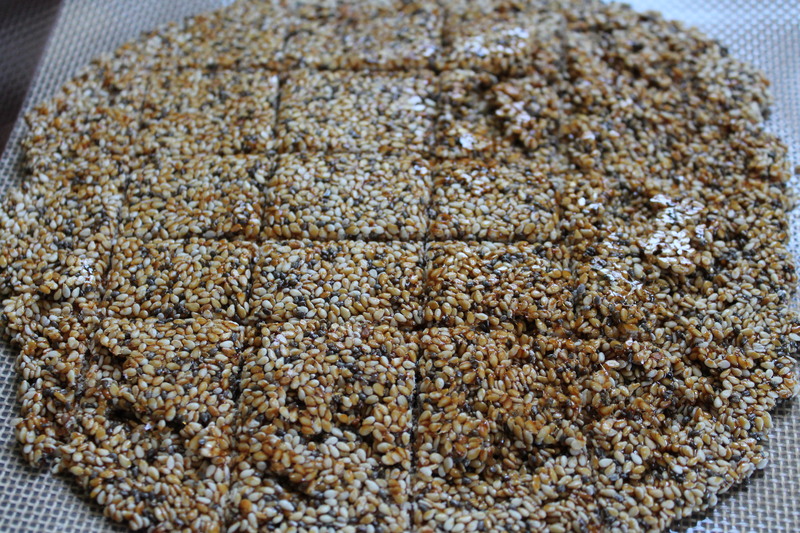 At first you think that is not going to be enough honey mixture to coat that much seed. It is plenty. I did not have any wax paper so I used one of my new baking mats. I used another to lay over top. I also don’t have a rolling pin (mainly for the husbands safety) so I used this high tech gadget called a can of soup. Worked fine. Okay as soon as I finished rolling I tried to remove the top baking mat. Nope not a good idea some of the candy mixture was coming up with it. I just stopped pulling the mat and mashed it back down over the candy. I popped the whole thing in the freezer for maybe 2 minutes. Took it out while it was still warm enough to cut. This time the top mat came up easily. Not wanting to damage the bottom mat I used a butter knife to ‘cut’ the candy into squares. I did not cut all the way through the candy. After letting the candy cool a few minutes I broke the pieces apart. Both mats had sticky stuff on them but I only had to run water over them for a few seconds and they were clean. I think I might be in love with silicone baking mats. 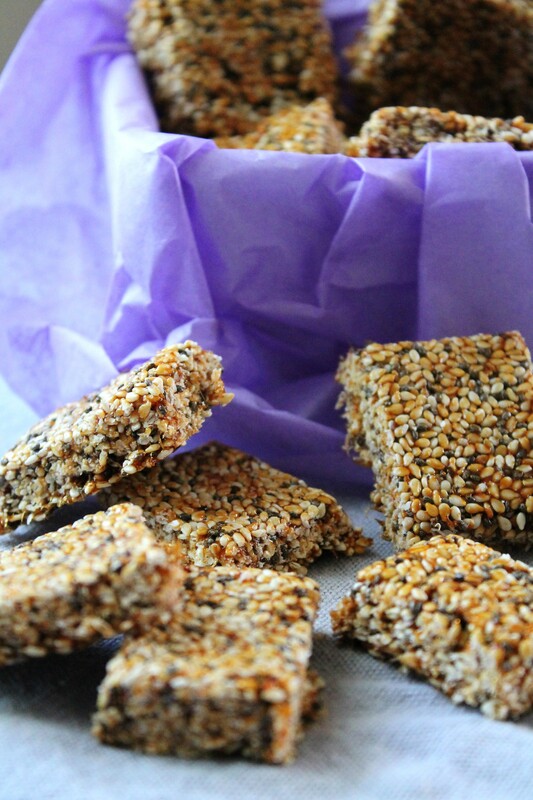 How did the Sesame Chia Seed candy taste? Great. Sweet with a toasted nutty taste. This is going to be my midday snack at work next week. Thanks for joining me on this Pinteresting adventure.